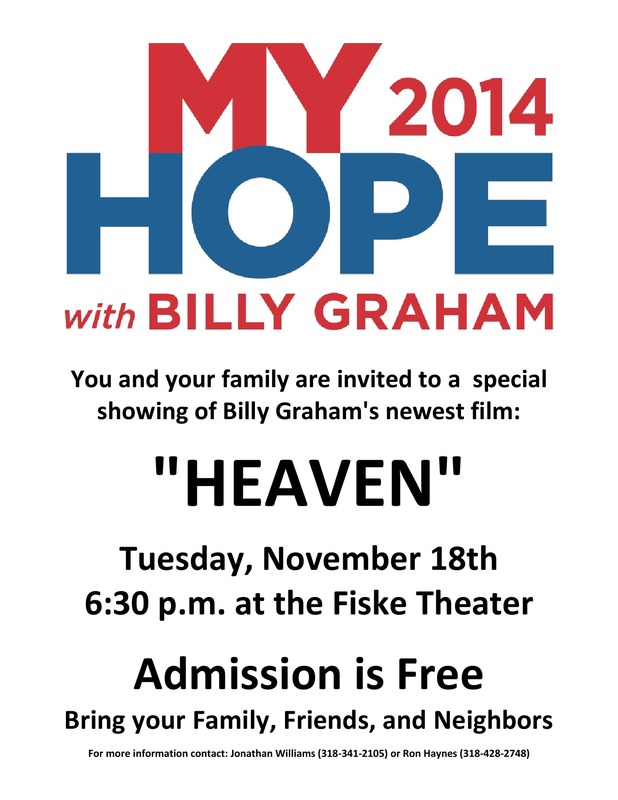 We are truly excited about the My Hope 2014 with Billy Graham campaign this year. We want to invite you and your church to take part in this outreach. I was late in getting this information this year so we are not as organized as I would like to be and have not been able to promote the kind of cooperation between our churches that we would like for an event like this. That being said, I am looking forward to seeing how God will use this event in our community. I have created several resources to help you promote this event in your church. I encourage you to especially take advantage of the prayer cards. Encourage you congregation to write down the names of their unsaved friends and family, and to begin praying that the Lord would prepare them to hear the message of the Gospel. Then they can invite them to come see the film with them. We hope to have a full house that night and pray that there will be many there who need to hear the message of hope and are ready to respond to the Good News of Jesus. We will need people to serve as greeters, prayer counselors, prayer partners to pray in advance for this event, as well as people who are willing to help with follow-up and discipleship of those who make decisions. If you and/or your church is interested in joining us in this outreach effort, you can reach me on my cell at (318) 341-2105 or email me at jonathanrwilliams@yahoo.com.